RB433AH is end of life (EOL). Mikrotik recommends RBM33G for functional replacement. The RB433AH is a more powerful version of the standard RB433. The 128MB DDR will be capable of supporting new RouterOS features coming. The microSD slot supports an additional memory card that can be used for a Dude database and other features to be announced in during Spring ‘08. 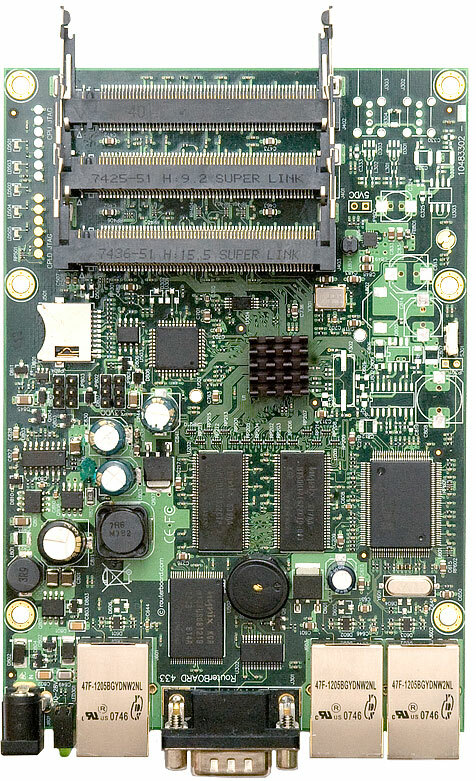 The 680MHz Atheros MIPs 24K CPU, that can be overclocked to 800MHz, with a 64KB/32KB instruction/data cache is probably the fastest CPU used in low cost wireless access points. The three Ethernets and mpci slots give you ample data interfaces to put the big CPU power to work. The RB433 and RB433AH replace the RB133 and RB333.